Joe Trohman Telecaster, TLC-Shaped Guitar from Squier in the Artist series. Squier introduces two new artist signature models, the J Mascis Jazzmaster and the Joe Trohman Telecaster guitars. The new J Mascis Jazzmaster features Vintage White finish, pickups and hardware are specified by Mascis himself. Features include a basswood body, C-shaped maple neck, rosewood fingerboard with 9.5” radius and 21 jumbo frets, two single-coil Jazzmaster pickups with three-position switching and dual tone circuits, gold anodized aluminum pickguard, Adjusto-Matic bridge with vintage-style floating tremolo tailpiece, vintage-style tuners, chrome hardware and J Mascis’ signature on the back of the large ‘60s style headstock. 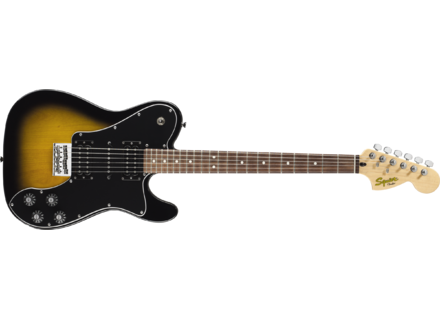 The Joe Trohman Telecaster is a new take on the early-‘70s Fender Telecaster Deluxe. This triple-pickup model comes equipped with an alder body, C-shaped maple neck, rosewood fingerboard with 12” radius and 22 jumbo frets, two open-coil humbucking pickups (neck and bridge), single-coil Stratocaster middle pickup, five-position rotary pickup selector switch, upper bout kill switch, vintage-style six-saddle strings-through-body hardtail bridge, chrome hardware, large 1968-style Stratocaster headstock with Trohman’s signature on the back, and Two-color Sunburst finish. The J Mascis Jazzmaster and Joe Trohman Telecaster are available at Squier dealers with a manufacturer’s suggested retail price of $599.99 each.